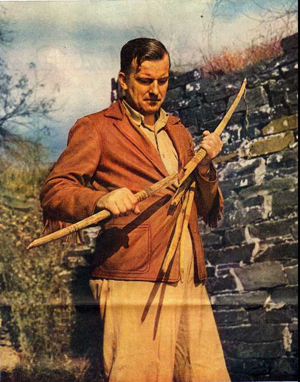 Frank Hibben is a well-known archaeologist who studied Paleoindian cultures and had a very long and very controversial career. He received his master’s degree in zoology from the University of New Mexico (UNM) in 1936 and his PhD in anthropology from Harvard in 1940. He then taught at UNM as a professor and also worked as the director of the Maxwell Museum of Anthropology on the UNM campus until he retired in 1975. Hibben's career accomplishments were considered controversial because he was accused of falsifying archaeological finds, although this was never proven as fact. Hibben donated money to UNM for the construction of the Hibben building, and, at his death, gave money for the endowment scholarships in anthropology at UNM. Additionally, he was a well-known big game hunter and is responsible for the importing the population of non-native oryx that live in the White Sands Missile Range in southern New Mexico. "Frank Hibben examines one of the 91 ancient bows which he discovered in the weird cliff house where they had lain undisturbed for 700 years in the Mogollon Moutnains of New Mexico"
2003 University Buildings Named on Shaky Ground. Nature 426 (6965): 374. 1995 The Mystery of Sandia Cave. New Yorker 71(16).